Most Christians struggle to grasp the relevance of the Old Testament and, all to often, fail to see the gospel kingdom themes present there that point to the salvation and new creation brought by Christ in the New Testament. 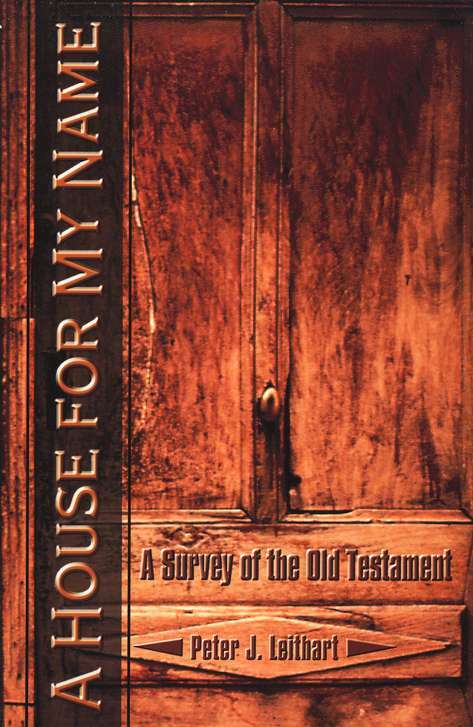 Into the midst of the confusion has stepped Peter Leithart and his book A House for My Name: A Survey of the Old Testament. With great sensitivity to the text and a wonderful and accessible command of the English language, Leithart present us with a text that draws us into the Old Testament by way of, among other things, a use of analogy he sees as present in the text linking it to the New Creation work God is doing throughout the Scripture, that which ultimately is consummated in the redeeming work of Jesus Christ. Although one may argue its presentation of vast analogies occasionally stumbles, Peter Leithart’s book A House for My Name presents a concise, readable, and enlightening theology of the Old Testament’s major themes that draws clear meaning for the Christian student searching for the Hebrew canon’s contribution in the overarching gospel narrative. Leithart begins his volume by giving, after a brief preface, an introduction that he states may be of interest to the “theological engineer who gets a thrill out of the music of the gears” (16), while he says everyone else should “turn immediately to the first chapter.” While being humorous, this also immediately sets up the book as one equally as usable for the scholar as the everyday Christian. Leithart intends on the volume to be a primer for laity and theologian alike and, in doing so, crafts quite the interesting work. In this introduction, Leithart gives a brief history of the mode of interpretation he is using in the book. He tells us that its roots lie in the hermeneutic of medieval monks wherein “the Old Testament was not merely a prefiguration of salvation in Christ, but the beginnings of that salvation, albeit in a veiled form” (17). He goes on to explain, “Knowing Christ meant knowing him not only from the pages of gospels and epistles, but knowing Him as He is presented in type and shadow in the Old Testament” (17). Leithart contrasts this with modern Christianity, which frequently has not known what to do with the Old Testament or, worse yet, has tended to toss it in the garbage. He cites the Marcionite separation of Old and New Testaments perpetrated by modern theological liberalism, citing Schliermacher’s defense of religion against enlightenment rationalism, but adopting its views of Scripture. He then claims that evangelicalism has not fared much better, stating that “Attacks on the ‘external’ support of religion, emphasis on emotional religious experiences, the idea that the kingdom of God is a nebulous and mainly inner reality—all of these are themes that can be found in countless books from modern evangelicals” (21). Leithart then spends several pages addressing a view particularly pertinent to that of his own tradition, the Presbyterian and Reformed churches. The view of R. Kendall Soulen, who has worked hard to restore the importance of the Old Testament to Christian theology, endorses a statement of the Presbyterian Church USA that says, “The church has not ‘replaced’ the Jewish people… Hence, when speaking with Jews about matters of faith, we must always acknowledge that Jews are already in a covenantal relationship with God” (22). Leithart takes issue, and rightly so, with the concept in this that the Jewish person may then, ultimately, be saved outside of faith in Christ. From Soulen’s view Leithart says that we should take the recognition that “the Old Testament must be our book if we are to be fully Christian” (26) while rejecting Soulen’s view that it should be read as a book having an integrity of its own, not referring to the New Testament. After analyzing several other viewpoints on the Old Testament, Leithart begins to address the way the book will henceforth be approaching the Hebrew Scriptures. He proposes a return to the medieval method. He brings forth the use of typography, although he offers a qualifier about the term up front. “In this book, the word has more baggage than usual,” he states, “for I use the term not only to highlight the principle that the Old Testament points ahead to Christ, but also to describe the structure of the Old Testament… When I speak of a ‘typological’ understanding of the Old Testament I am further calling attention to the literary devices that the Bible uses to communicate its message” (27). He explains that the allusions are not only found in verbal quotations, but in analogous situations, settings, and events (34). Entering the first chapter of the book, Leithart begins his work through the Scripture in earnest. Starting appropriately in the beginning of creation, he sets forth the concept that creation is like a house that God has built, with three different levels, the sky/heavens, the earth, and the sea. In creation, the six days are laid out according to these levels, in a pattern. On the first day, God creates light and darkness, thus on the fourth day he creates Sun, moon, and stars. On the second day, he creates the waters above and below the earth, thus creating birds and fish on the fifth day. Finally, he creates freshwater and land on the third day, creating land animals and man on the sixth. Thus, by the end of the week, he has created the “three story house,” which becomes a frequent theme (the specific distinctions of sky, land, and sea, that is) throughout the rest of Scripture (45). Leithart points out that this is even the case when the plagues come up Egypt. The first, fourth, and seventh plagues are related to water; the second, fifth, and eighth plagues are related to land; and the third, sixth, and ninth plagues are related to the sky (47). Leithart then focuses a portion of the chapter on the intention of man in the Genesis narrative and on the land of Eden. Leithart theorized that, by all scriptural evidence, Eden is a land on a mountain, with the Garden in the land. The garden has a river flowing into it and rivers flowing from it, therefore it must be midway up the mountain. Also, he notes that the entrance to the garden is in the east of it, and thus one must move west to enter the garden; it thereafter becomes a theme that whenever someone is drawing closer to God, it is noted that they are moving west. Indeed, the Israelites enter the Promised Land from the west (thus showing that entering the Promised Land is, in a sense, returning to the Garden), and the magi even come from the east to west to visit the young Jesus, who brings the new creation (53). Also in the chapter, Leithart addresses the issue of repetitious creation and fall. For Adam, his failure to do his priestly duty and guard the Garden allows sin to occur. After the fall happens, God promises that the seed of the woman will crush the serpent’s head, but he does not keep this promise right away. Meanwhile, with each sin, there is a judgment that comes, a continual casting out. After Adam and Eve’s sin, they are cast out of the garden; after Cain’s sin, he is cast out of the land; after the Sons of God sin, they are cast out of the world. What is notable is that Leithart, in agreement with Augustine, sees the Sons of God as simply the sons of Seth, who is righteous, while the daughters of men are the daughters descended from Cain who are unfaithful (56), rejecting the Book of Enoch’s idea of a fallen angel/human relationship; indeed, Leithart does not even mention an explanation other than his own. Before the chapter concludes, Leithart also relates the establishing of the houses of Abram and later, likewise, David. Through David’s kingly house and the people of God in the house of Abraham, then, we see a house built for God, the temple in Jerusalem. The next chapter focuses on the theme of the Exodus and the portrayal of saviors as a type in the Scripture. This section pictures both God as ultimate savior (leading Jacob’s family, through Joseph, into Egypt to spare their lives, etc.) as well as types like Jochebed who places her baby Moses into an “ark” (reminding us of Noah, who also represents this type) and Moses himself, who ultimately is used to lead Israel out of Egyptian slavery (75). In Moses, we also see a type of Christ in that he is rejected when he tries to save his people. It is only when he goes to Midian that he is embraced, much as how Christ is rejected by his own people, but embraced by the Gentiles (76-77). At Sinai, we then see a picture of marriage between God and his people, a wedding at the embracing of God’s covenant by his people (however short-lived). The chapter rounds out by describing the Tabernacle in terms of the House of God, the institution of sacrificial symbolism, and the vestments worn by the priests, all set up to symbolize for Israel God’s relationship to them and his continuing salvation work. The book continues in similar patter throughout the Old Testament, highlighting major themes and especially the repeated roles that various individuals play in showing new creation/salvation history. The eighth chapter rounds out the book nicely by concluding the story with the coming and Jesus and the Gospel of John. In it, Leithart says, “We’ll see over and over that John is telling us that the story of Jesus is the last chapter of the story of Israel” (241). Here he points to Jesus as a greater figure of Jeremiah, prophesying about judgment coming upon “this generation” (Mt. 24:34). He also says Jesus is a greater figure of Solomon, the Son of David, and the builder of the great temple of Jerusalem. Leithart acknowledges that Jesus is the Son of David in the perfect sense, and that “As the true king of Israel, Jesus builds a temple that is more glorious than anything Solomon built. He’s building us into His house” (243). Leithart is also concerned that many Christians see John as not being concerned about the Jews. On the contrary, he writes, “John is every bit as interested in what Jesus meant for Israel as any other New Testament writer… John’s gospel urges Christians to make a firm break from the temple and synagogue and to continue in the new Way of Jesus” (244). He cites the debates between Jesus and the Jews as evidence of this. He also draws an analogy between the use of darkness in John 1:5 with the Jews. The Jews are in darkness seeking light, but cannot grasp it. Darkness comes before light (as Genesis 1 places it), and thus the Jews are stuck in the Old Testament period before the Light, and they cannot overcome/seize it. Leithart also identifies Israel as “Babylon the Great” of Revelation. He paints Jerusalem as the great city that falls to destruction and sees the Church as a new bride for Christ and a new Israel, being rid of the old bride Israel once and for all. Leithart then makes note of several of Jesus’ actions in the gospel of John, such as turning water into wine. He makes particular note of Jesus’ “cleansing” of the temple. The fact that the Lord overturned tables where sacrificial animals were sold does more than clean up worship at the temple… it brings it to a complete halt. Leithart believes the symbolism here is very deliberate in showing what Jesus is going to do and is doing (252). He also sees Jesus reference to “the World” in John’s gospel as meaning the Jews. He sees Christ’s trial as much more a trial of the Jews, who are refusing to bow to their king and “Not long after this, Yahweh will take his palace from Israel” Leithart says, referring to the fall of Jerusalem and the destruction of the temple. Yet, even with Leithart’s harsh words, he offers hope because “when Old Israel dies, Yahweh, the Lord of life, brings a New Israel from the grave. The death and resurrection of Jesus, who is the true Jacob and Israel, who is the temple flowing with living water, is the sign that a New Israel will be born” (262). Peter Leithart has created a magnificent work here. His detailed analysis of the entire Old Testament story sheds light on many aspects that the average reader might miss. His particular analysis of types uses over and over in the characters and language of the Old Testament is refreshing and brings a New Testament relevance to the Old that the average Christian reader is prone to not see. Furthermore, Leithart’s strong command of the English language (it is not at all surprising that he teaches literature at New Saint Andrews College) means that the work is not only highly valuable as a study tool, but it a comprehensible and, indeed, even highly enjoyable book to read. Among a relatively short list of criticisms, one interesting note about Leithart is that, while his overall writing style is thoroughly accessible, he consistently uses the Authorized (King James) Version of the Bible as his primary translation of Scripture. His constant preference for this translation in his writing means that the Scripture he cites is sparsely peppered with archaic language, however not to the extent that it makes the work incomprehensible. Still, one could wish sometimes that a later translation would be used for sake of the overall accuracy and readability of later translations, even if they have paid a bit out of lyrical beauty in comparison. The primary hesitation one might have with the actual content of this volume is that Leithart could be accused of making too much of his use of scriptural analogies. It runs the risk of interpretive maximalism, or finding things in the text (via the oft-used allusions, allegories, typology, foreshadowing, etc.) that are not there. The general methodology, popularized by theologian James Jordan, tends to expose content in the text that others typically miss. This is a necessary helpful corrective to the extreme grammatical-historical readings, however it also runs the risk of being extreme to the opposite end and creating elements that God and the human authors of Scripture never intended to be read into the text. This is to say, one may not agree with all of Leithart’s pictures in the text, but may still appreciate his approach as a whole. For example, the idea of certain figures being types of others may seem a bit stretched at times to fit into the mold of another character’s traits for the sake of analogy. It may also be that Leithart’s seemingly harsh language regarding Israel in the final chapter will raise an eyebrow. It is hard, being as well reasoned as his argument is, to totally dismiss his ideas, especially if one has any inkling of a partial-Preterist leaning. It is quite easy to see how he could come to identify Israel/Jerusalem with Babylon the great and, thus, reconcile it easily with the fall of Jerusalem. However, at the same time, the language he uses in referring to Israel dying and a New Israel being born from its bones, among other references, seems a bit disquieting. The replacement theology here may not sit well with many readers. A better argument or analogy would seem, rather, to be that Israel has not so much been “replaced” by the Church, but has been fulfilled in the Church, because if “not all Israel is Israel,” then Israel has really primarily been a faith community all-along, and it was Christ who opened the doors beyond just the national Jews for that to happen. This being said, Leithart still gets the picture that the Church is the New Israel, even if how he gets there surprises a few. Peter Leithart has truly created a much-needed volume in the area of Old Testament studies. For the scholar, pastor, and armchair theologian alike, he has introduced thoughts on the Old Testament that will be thought provoking and encouraging, whether one agrees with all of his end interpretations are not. Therefore, while not a work in such a mode of survey as one could safely agree with everything, it is a work deep enough to provoke though and even disagreement at times. In his expert analysis of the text, Peter Leithart introduces the reader to the pure relevance of the Old Testament for New Testament readers. For some, because of this work, they will find their connection to well over half the Bible’s text for the first time.